Discussion in 'iPhone and iPad Games' started by BigDich, Feb 12, 2019. 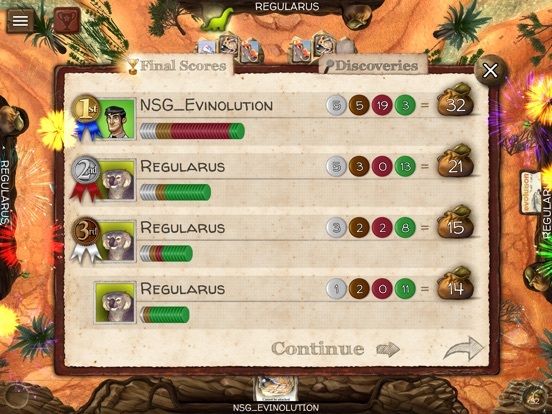 Inspired by the award winning game with more than 1.6 million players, Evolution has arrived on iOS! 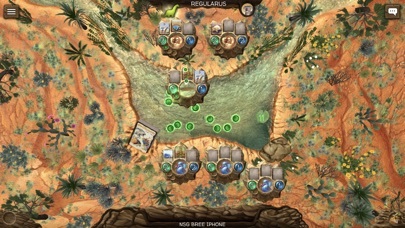 Adapt, survive, and thrive in a beautiful and ever-changing ecosystem enhanced by incredible art and thoughtful, balanced mechanics. 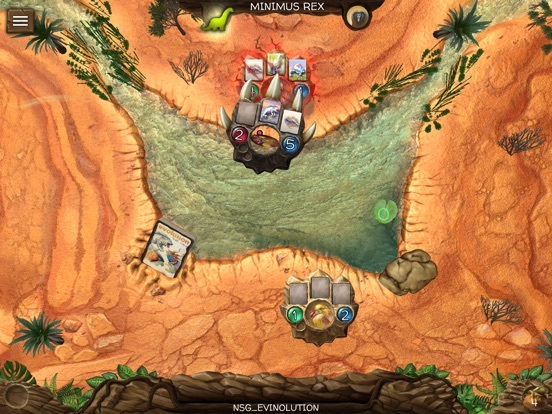 Reviews: "My Next Gaming Addiction" -App Addict "A powerhouse game poised to steal the thunder of some of the most popular games on the app store" -Touch Arcade "This game is brilliant"- Dice Tower "Simply fantastic, one of the best games available" Man vs Meeple NATURAL SELECTION IN ACTION In the game Evolution, you adapt your species to survive, and stay one step ahead of opponents. -Watering hole running dry? Evolve a long neck to reach food in the trees. -Staring down a Carnivore? Develop a hard shell to fend off an attack. -Evolve up the food chain to become a the most successful species. CHALLENGING AND ADDICTIVE Do you evolve protection from Carnivores, or find a way to eat if there is no Food in the Watering Hole? The ecosystem is constantly changing, and you’ve got to figure out what your opponents are up to. 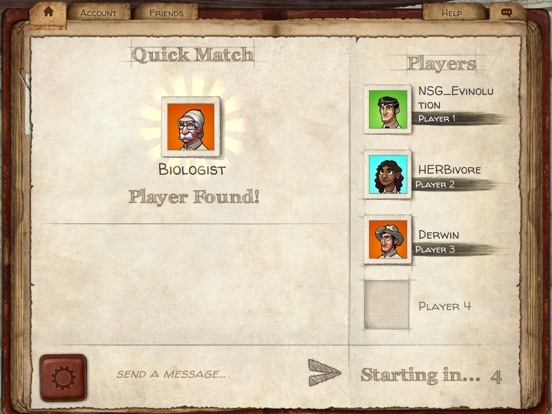 INTERACTIVE TUTORIAL Our friendly professor will guide you from one watering hole to the next on our learn-as-you-play tutorial, showing you how to survive before sending you off to make a name for yourself. Hone your skill as you progress from lowly Biology Intern to competing for the Nobel Prize! 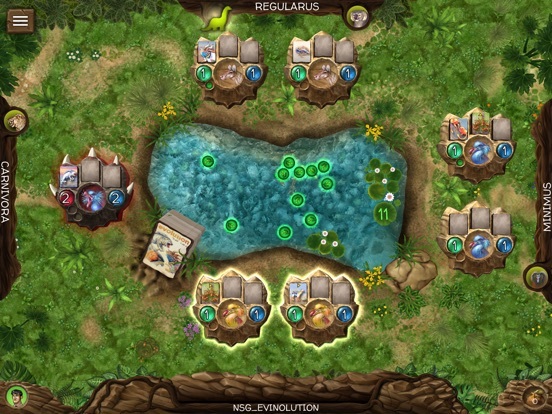 EXPLORE THE CAMPAIGN Explore the mysteries of Evolution Island and discover distinct Boss opponents. As you move through the campaign you’ll unlock new “Apex Species” that are masters of specific strategies; defeat them to add them to your menu of single-player opponents. 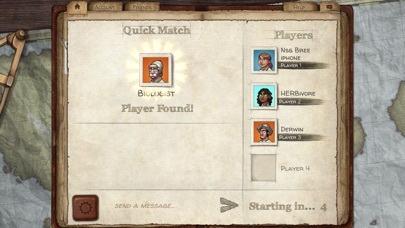 MATCH MADE MULTIPLAYER One click and the game will match you with players of similar skill in a fast paced online game. Make friends in the game and set up custom games, or rank up in the ongoing seasonal tournaments and see how far you can go. 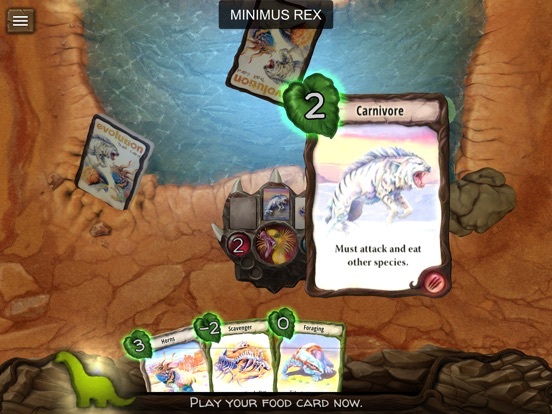 ENDLESSLY REPLAYS, ONE PRICE This isn't a collectible card game, the full set of cards are included in the base game. 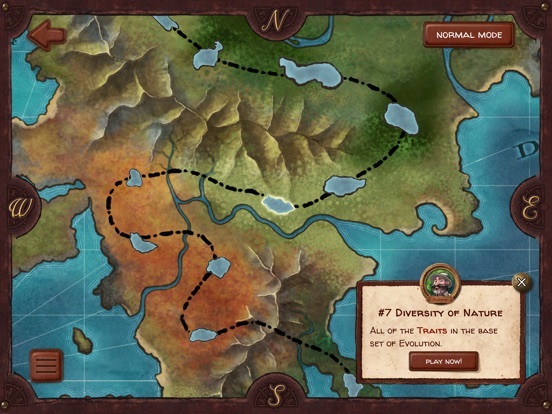 Thousands of possible species combinations evolve from 17 unique trait cards, meaning no two games are ever the same. PACE & POLISH With a smooth user interface and fast, informative animations, Evolution was built to satisfy a quick fix of intense strategic battles. Easy to learn, almost impossible to master, one game and you’ll find yourself addicted. 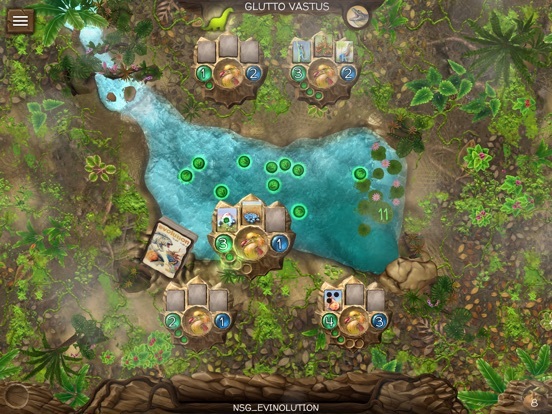 Evolution isn’t just a top tier strategy game – it’s a whole new animal. Is this ad supported? Not paid and no IAPs. Im wondering too, apparently the game also released today on steam, where it costs about 13 €. Wonder if they accidentally released it without a price. I’m downloading to give it a shot. Its really good! Kinda hope they implement an unlock IAP, as I would gladly throw them some money for their work. 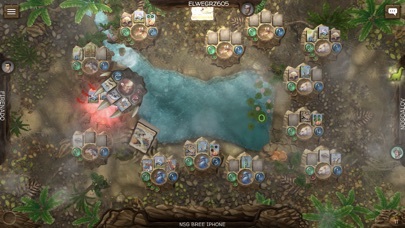 The IAP is available by pressing the NORMAL MODE key on the island map screen when playing the Campaign. Discovered it by accident - seems a strange design choice. £7.99 for the next week; then £9.99. Interested in reading some reviews. I know it’s free but, with my backlog, time is precious. Anyone know if an update is on the way? I’m on a XR and the screen is not optimized. There’s a black bar on the right of the screen and not the left (which takes away precious screen space). Also, the options menu is cut off on the left. I hope they fix this as I really like the game. I like this. But it does warm up my device a bit. Cool game but things are small, writing is small, and some “wasted” space, though I haven’t played a 4-player game. Feels too tiny. Not a fan of the menu screen not being full screen. 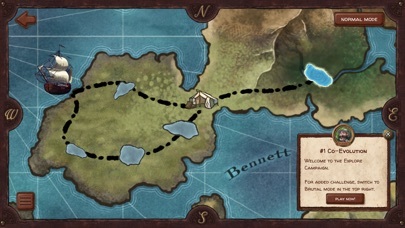 Gameplay wise, finished the tutorial and it’s great. Hope they keep giving it love. The games the TA review says this will compete with do have great UI which is not as important as gameplay by any means but it does make a difference. Geez a pretty much glowing review by TA. Comparing this to hearthstone and other TCGs despite this being a board game, and apparently with constant decisions to boot. I really wasn’t expecting that! (Never played the game though). But this game is ranked 361 on boardgamegeek which is no place for a favourite. Really taken back by the TA review, might have to give it a whirl myself. Gameplay-wise I see the comparison to hearthstone, etc. but the use of a digital platform I disagree. It’s a great version but it feels like like a board game made digital. 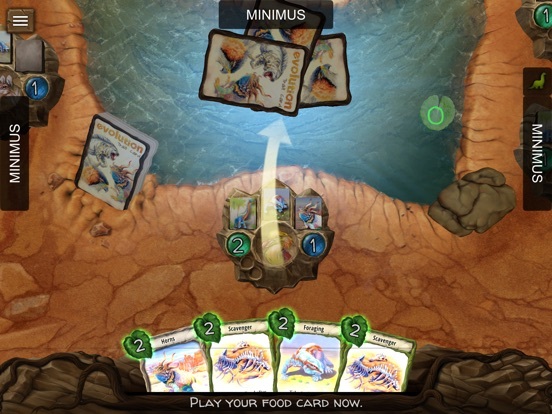 Hearthstone & Legends used digital perfectly to bring the game “alive” & make everything more than a card. Nothing negative about this game just my thoughts. Dice Tower reviewed the physical game very well (and the 2 expansions). Pockettactics gave the mobile version 5 stars. I’ve had a play of 5 or so campaign matches now and I think I’d have to agree with you. 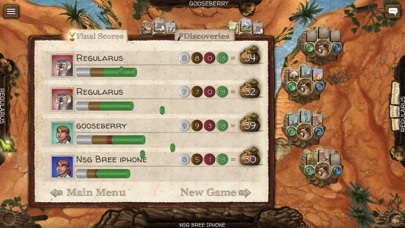 It is still very much a board game gone digital. 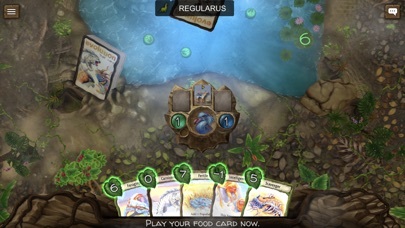 Frankly I only barely see a glimpse of a hearthstone similarity. Maybe because you hold cards in your hand down the bottom and drag them out to your turn. 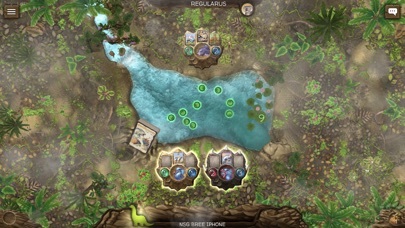 The board is also quite green and at times vaiguely resembles the look of a TCG. Though it shouldn’t be mistaken, this game is not that. I’m now also noticing that the mechanics are very rock-paper-scissory. One “trait” on your species typically is there to be another trait on the opponents species. That said, there’s more combinations than just R-P-S’s. It’s more like R-P-S-stapler-pencil-Cardboard-printer-press zero first to dial out. There’s heaps of X beats Y’s to keep track of which is cool. My only gripe....is unfortunately a bit of big one which might see me put the game down early. It’s the UI. Poor choices with the UI. And I can’t believe the professional reviews so far aren’t docking this a mark for that. They must not be playing on a phone, yet I’m even on an XS Max and while it’s by no means not playable, it’s just poor choices and not comfortable. 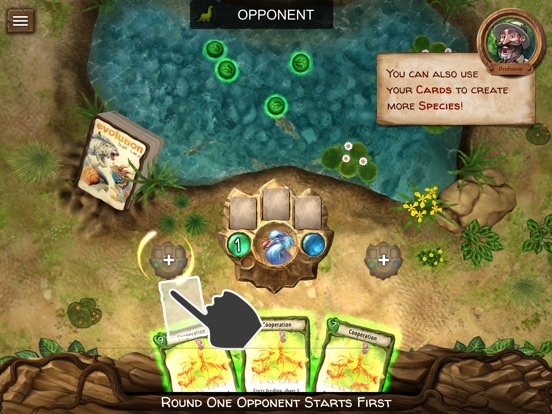 There’s so much wasted space on the screen, and at times, I’d say viewing the opponents species traits, the card underneath will appear rather small and under your finger. All that real estate wasted. I can’t help but feel this almost would have been better suited in portrait. Sure 4 way matches would’ve been crammed but I say better represented that way. The pond in the middle is unnecessarily large imo. Ok it’s there for immersion but it just displays the available food pool. Well I don’t spend my time counting the individual food pieces when they show a single number at the side of the pond for this. 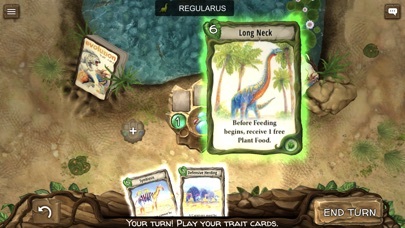 A number with a background image of a pond would have sufficed and freed up that real estate to perhaps make the species and their trait cards bigger. Not ideal the way it is, at least on phones. Still a nifty little game. Have to sit down to spend some more time with this but it is very weird in the iPhone X with that right part of the screen cut off. I’d prefer full screen obviously but at least make it centered. I think there is a feedback button in the app. Let’s send these comments to them & make sure they get feedback. They may work on some of our thoughts. I already sent them a message through there regarding the screen issues. No response yet. I was hoping they’d be active here. Anyway, let’s cross our fingers. edit: I was mistaken. It’s also skewed to the side on iPhone XS Max as well. Hopefully an update coming to fix. It’s still playable for me though. 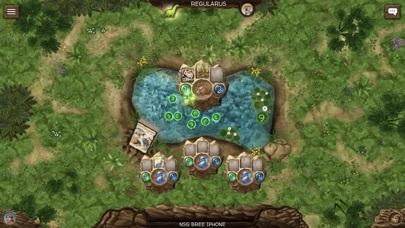 The menu screens are centred but the gameplay screen is skewed. Hmm I clearly see - Offers In-App Purchases - "Full Game"
It was still at v0.9.6 just a few weeks ago so I guess the screen fix will come soon. They seem to be pushing updates weekly.